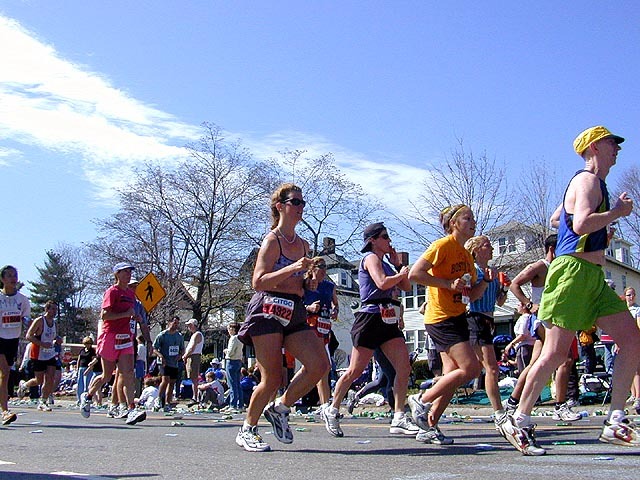 i've never been to the boston marathon before. 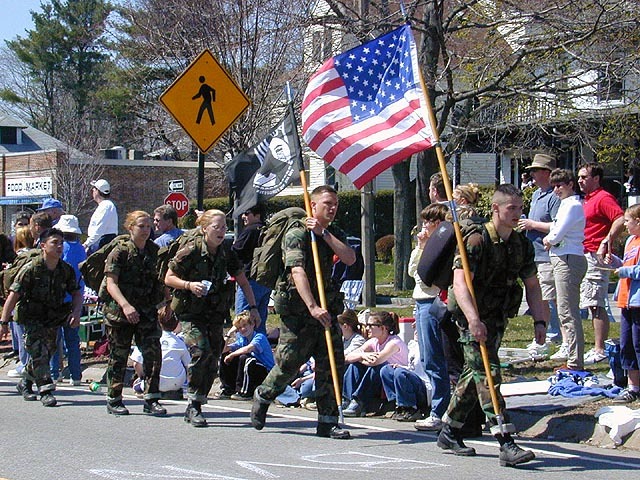 within the past 7 years, i've always had to work on patriot's day, the traditional day of the marathon. last year i did have the day off and could've gone (020415), but instead i went running with eliza jones then spent the rest of the day at the mt.auburn cemetery. this year however i found myself with plenty of free time, and decided it'd be worth it to see what all the excitement's about. i went with julie, who was meeting her hash running friends somewhere in newton, along the marathon route right before heartbreak hill. she was late in coming to pick me up because she couldn't find her car key. when we finally got there right when the race had started, we bought some barbecue food then camped out with the rest of her friends, none of whom i knew. she has often invited me to come out and run with them, but after meeting the bulk of the members, i think i'll stick to my solitary running. call it what you will, but the hash is just an excuse to go drinking. every other conversation revolved around beer, like the kind of deep talks frat guys must have. they set up a little beer stop, hiding a keg in a large plastic bag, and then later giving out free beers to the runners. they all had nicknames, most of them highly inappropriate and of a frank and sexual nature. they'd break out into chants, peppering their songs with four-letter words within earshot of young children. 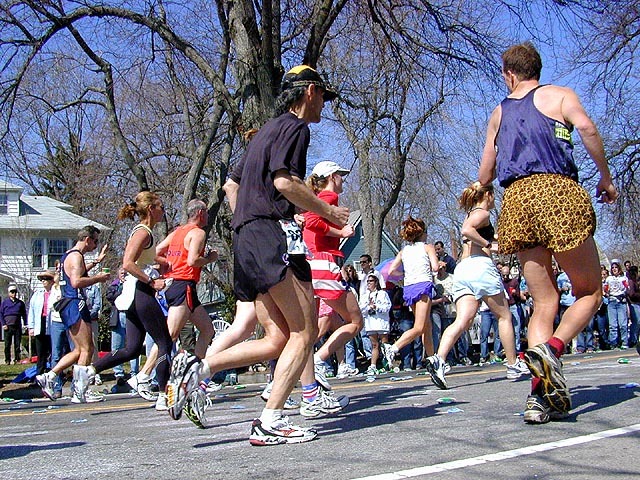 i spent most of the marathon on the opposite side of the street, taking photos. 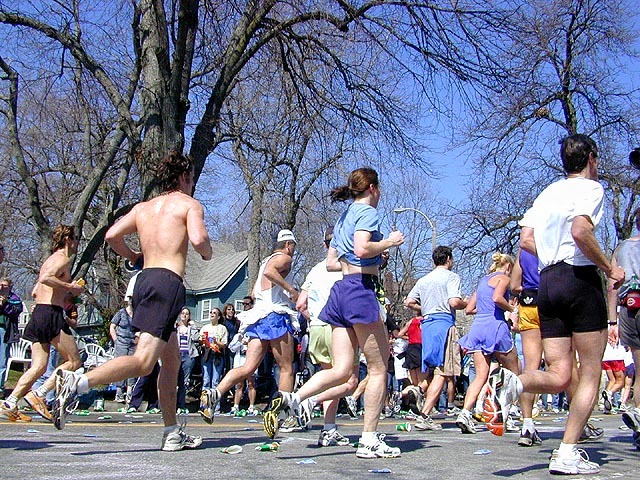 weatherwise, it was great for spectators, a warm 60's with a blue sky, but probably too warm for the runners, who would probably prefer a colder day. since we were at the 20 mile mark of the marathon, it took a while before the race actually arrived at where we were camped out. 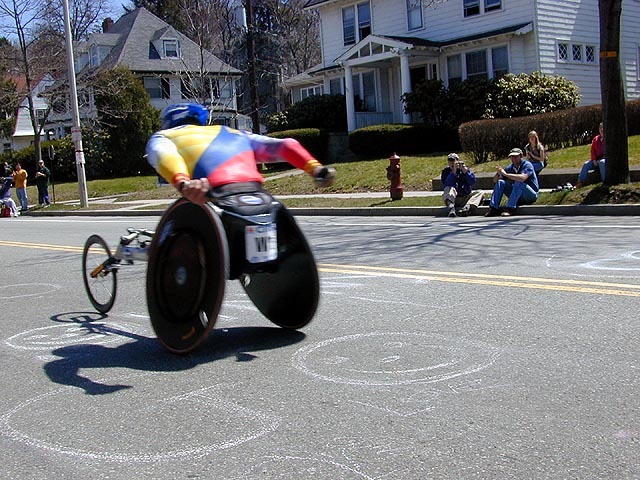 first came the wheelchair division, which had this futuristic feel to it as all the racers were equipped with these highly streamlined racing wheelchairs. i can't imagine the kind of arms these people must have in order to "run" 26 miles entirely through their upperbody muscle power. 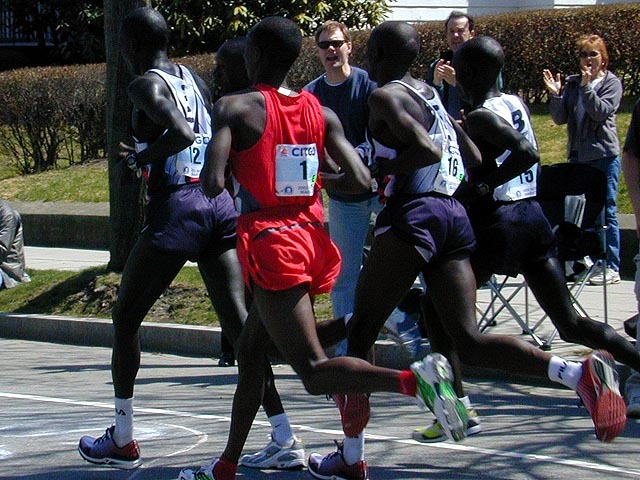 next came the men, with a small kenyan contingency in the lead. 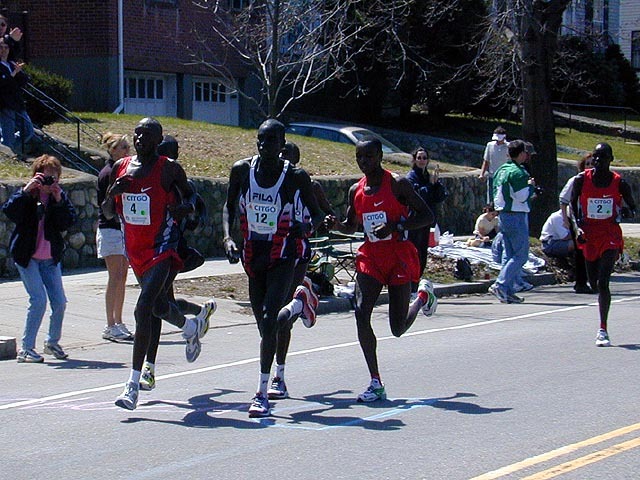 no.12 robert kipkoech cheruiyot would later win in the men's division. 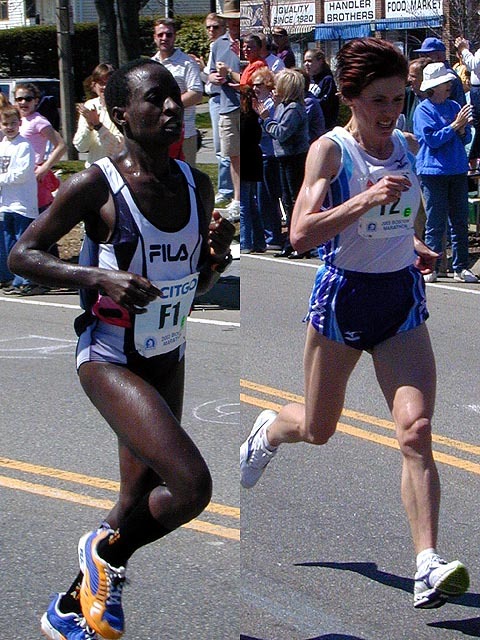 the men was followed by the women lead (note: in the boston marathon, both men and women run together at the same time), with russian svetlana zakharova in the lead. 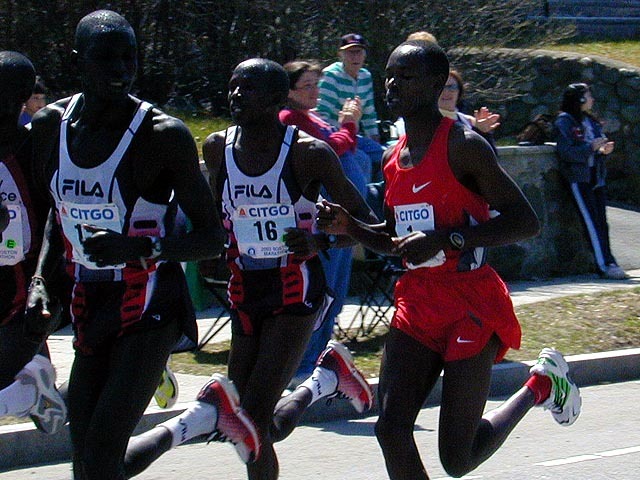 last year's winner kenyan margaret okaya was in 3rd or 4th place when they passed us. 6 miles later zakharova would end up winning the women's division. there were some national guardsmen stationed throughout the marathon route. we knew the race was approaching us because a fleet of motorcycle police officers would first make a sweep of the road, telling people to move back, then the official marathon truck would drive by, with the runners not far behind it. also, the sky would be buzzing with a handful of helicopters. 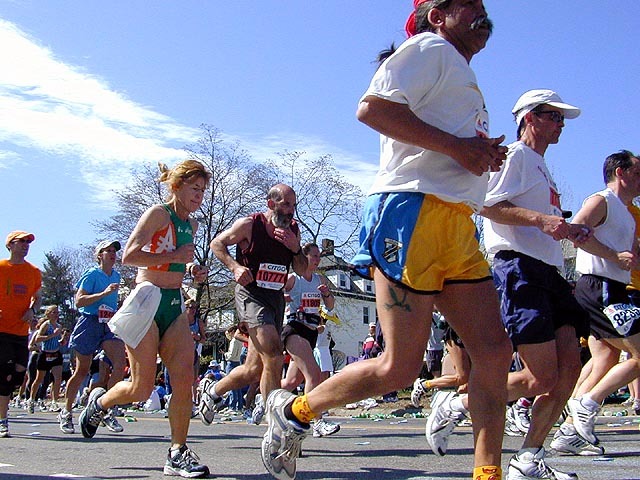 at first there were only a few runners, the elite ones with the fast times, but then the rest of the runners would arrive and the street would be jammed with runners, like a sea of fleeing lemmings. 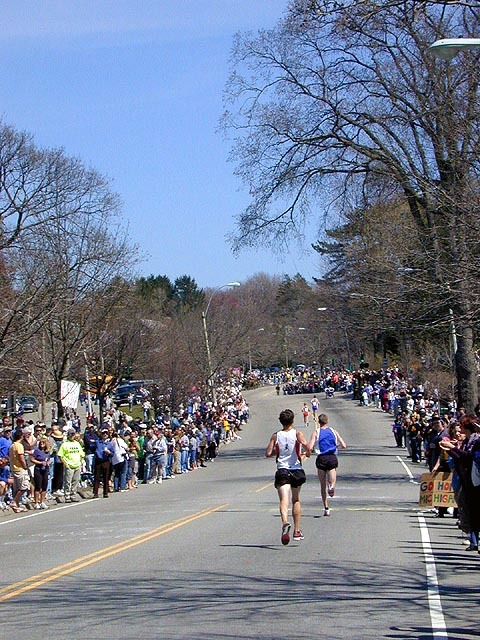 as the race progressed, eventually the road would be covered in discarded gatorade and belmont spring water cups. 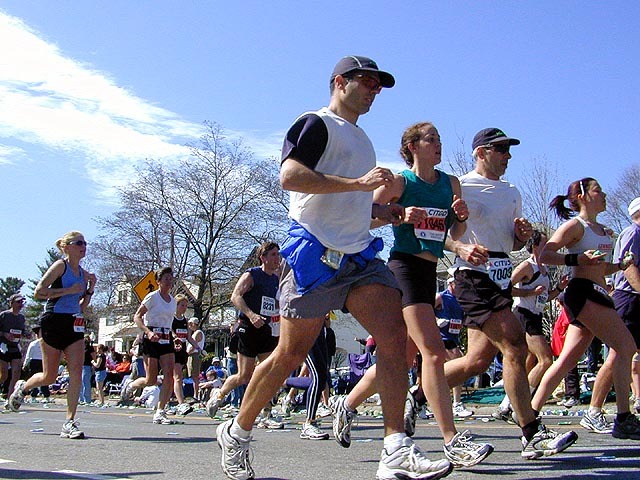 most people who run marathons have a certain body type, tall and skinny seem to be the ideal shape. you could tell the people who weren't officially registered but snuck into the race anyway because they didn't have a number. some runners also had their names either written or taped onto their body, making it easier to cheer for them. and a few runners even dressed up (costume wise), i saw a few supermen, one wonderwoman, one hulk, a guy wearing a tv box on his head, and a couple that was dressed in a specially made tuxedo/gown ensemble. costumed runners are usually more towards the back of the pack, since i think their main objective isn't really to race but more to have a good time. 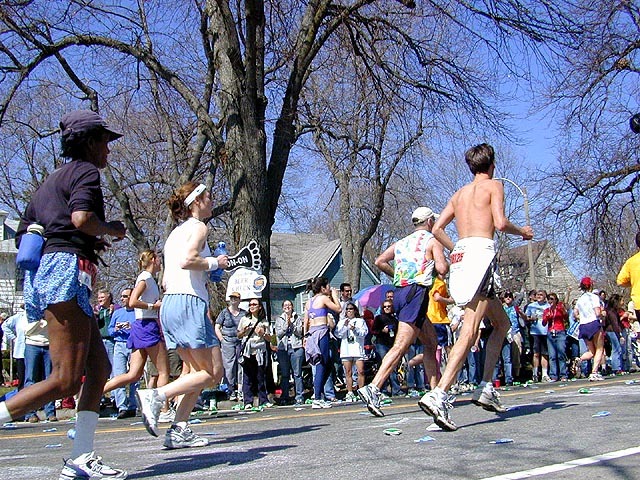 i also never got to see will ferrell, but i probably wouldn't have been able to pick him out of the crowd anyway, the runners were all moving pretty fast. julie left at 4pm, and that's when i left as well. she wasn't able to give me a ride back home because she was going straight to rhode island, however she was able to bring my collapsible chair back with her so i wouldn't have to carry it. i walked down to newton center where i got onto the green line after 2 other trains had passed the station because there were too many people onboard. it took me an hour and a half to get home, standing the whole way in crowded, hot conditions. i narrowly came to throwing up on the green line because i was so motion sick and tired. the red line wasn't any better, with the exception that it makes less stops. on the train i saw a few people wearing the telltale boston marathon silver jacket. back at home, after a shower, i fell asleep briefly, waking up to make some french bread pizza for dinner and finish the rest of my edumame beans.